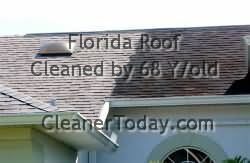 Shingle Roof Cleaning Photos - See the results. DIY Roof Cleaning Pictures from customer's roof cleaning projects! I just wanted to show you how well the Roof Cleaner QSE 4500 I had ordered from you is working. I have a picture attached which shows before (on the right) and after (to the left). Here in Florida the roofs are not that steep so I decided to try it. I am 68 years old and roof cleaning was easy. I bought the mold killer after Mississippi flood. It had a Pleasant aroma, No rinse necessary and a little goes a long way. Great service and awesome prices.